Salah al-Arouri (al-Mayadin, March 30 2019). Syrian opposition sources reported that at least seven people were killed in the strike attributed to Israel in the Sheikh Najjar area in northwestern Aleppo city, on the night of March 27-28. According to these reports, the sites targeted were Iranian weapons depot located between the city’s industrial zone and the airport. Iranian media did not report on any Iranian casualties or an Iranian connection of any kind to the bombed targets. Senior Iranian officials condemned the decision of President Trump to recognize Israel’s sovereignty over the Golan Heights and described it as a grave violation of international law. In the economic sphere: The Syrian government approved the agreement signed between the Syrian Electricity Ministry and the Iranian energy and infrastructure giant, MAPNA, to build a power plant in Lattakia. In Tehran and Baghdad, both governments agreed to put into force the agreement reached during President Rouhani’s visit to Baghdad to waive the visa fee for Iraqi and Iranian travelers between the two countries. The Deputy Head of Hamas’ Political Bureau, Salah al-Arouri, declared in a media interview that Hamas is determined to bolster ties with Iran, and that the practical implications of this improvement in relations is already evident on the ground. The Syrian Observatory for Human Rights (SOHR) deported (March 28) that at least seven people were killed in the strike attributed to Israel in the Sheikh Najjar area in northwestern Aleppo city, on the night of March 27-28. According to SOHR, those killed in the strike were an Iranian citizen and six Iraqis, members of pro-Iranian militias. The Syrian regime’s news agency, SANA, on the other hand, reported that the strikes caused only material damage. Iranian media also did not report on casualties resulting in the strike. Syrian opposition sources reported that the sites targeted were Iranian weapons depot located between the city’s industrial zone and the airport. 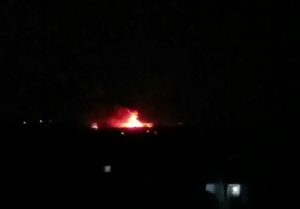 The strike attributed to Israel in Aleppo (Tasnim, March 28 2019). Iran condemned the decision of the United States President, Donald Trump, to recognize Israel’s sovereignty over the Golan Heights. The Iranian President, Hassan Rouhani, stated that no one would imagine that someone in the United States would come and bestow a territory belonging to one nation to an occupying country. He added that this was the norm in the colonial period, but there is no precedent for such a move in the current century (IRNA, March 26). The Speaker of the Majlis, Ali Larijani, also condemned President Trump’s decision, commenting that it is opposed to international law, international resolutions and basic human principles. He claimed that the support of the White House to Israel is the main reason for recent tragic events, such as the terror attack in New Zealand (Mehr, March 25). Syrian source reported that the ministerial committee on economic affairs of the Syrian government ratified an agreement that had been signed between the Syrian Electricity Ministry and the Iranian energy and infrastructure giant, MAPNA, to build a power plant on Lattakia’s coast that would generate 526 megawatts of electricity (Sensyria.com, March 30). The agreement to establish the power plant was signed during a visit of the Syrian Minister of Electricity, Muhammad Zuhair Kharboutli, to Tehran in September 2018. At the time, Kharboutli declared that the power plant project is important and strategic for Syria’s electricity supply, particularly in the coastal area, and that the project is set to be completed within three years (SANA, September 28, 2018). In an interview, the Secretary General of Hezbollah, addressed the visit of the U.S. Secretary of State, Mike Pompeo, to Beirut on March 22. During the visit, Pompeo declared that Hezbollah threatens Lebanon and condemned the support the Commander of the Qods Force, Qasem Soleimani, offers to Hezbollah (Al-Manar, March 26). Nasrallah stated that Iran and Soleimani played a major role in preserving the safety and security of the Lebanese people. He commented that Soleimani has stood by Hezbollah, and that the organization fights using Iranian weaponry against the terrorist organizations and liberated Lebanon from the “Zionist occupation” supported by the United States. On March 27, Iranian President, Hassan Rouhani, spoke on the phone with Iraq’s Prime Minister, Adel Abdul-Mahdi, and agreed to speed up the efforts to realize the agreements reached between the two countries during President Rouhani’s visit to Baghdad last month. During the conversation, President Rouhani reportedly defined the relations between the two countries as “strategic and historic.” He emphasized that the relationship between Iran and Iraq serves both nations and does not harm any country in the region (Fars, March 27). 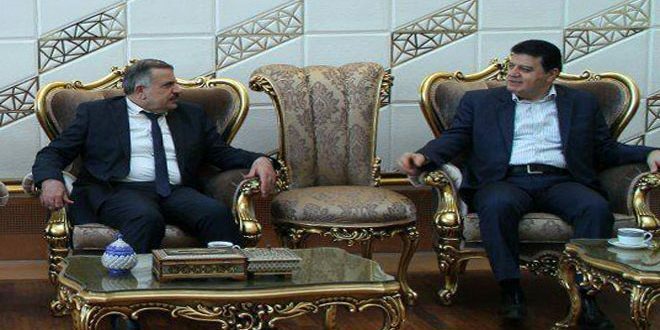 The next day, the Spokesman of the Iranian Ministry of Foreign Affairs, Bahram Qasemi, announced that Iran and Iraq decided to implement the agreements reached during Rouhani’s visit to Baghdad concerning the visa waiver for citizens of both countries wishing to enter Iraq and Iran. The visa waiver came into effect on April 1, 2019 (ISNA, March 28). The visa waiver is expected to make it more affordable for Iranian pilgrims and traders wishing to visit Iraq for religious reasons or for business.